With so much confidence in the defense and concern about the offense, little had been learned about Florida Gators football’s special teams unit as it prepared with the rest of the team to enter the 2015 season. For head coach Jim McElwain, who places a premium on special teams and said at the onset of his tenure that he would work closely with that unit, the returns appear to be positive with a week to go until the campaign begins. Florida’s starters at kicker and punter have been known for quite some time with redshirt junior Austin Hardin and redshirt sophomore Johnny Townsend holding those positions, respectively. Though Hardin struggled as a redshirt freshman in 2013, hitting just 4-of-12 field goals with a season long of 33 yards, he proved to be more consistent over the final four weeks of 2014, ending the campaign 7-for-10 with long conversions from 48, 49 and 52 yards. After stepping up to alleviate some of the Gators’ concerns at punter during his true freshman season, Townsend sat out in 2014 as Kyle Christy concluded his career. With two more offseasons under his belt, Townsend has not only locked down that job, he will also be Florida’s primary holder on field goals with redshirt sophomore walk-on RB Case Harrison serving as his backup. Walk-ons freshman Ryan Farr and redshirt junior Jonathan Haney continued their long snapper competition from the spring and got a new face to go head-to-head with in freshman walk-on Jacob Tilghman. McElwain is not yet sure how that will play out. One of two spotlight special teams positions in the return game, of course, is gunner, where Gators defensive backs like Will Hill, Loucheiz Purifoy and Keanu Neal made names for themselves well before they became secondary stars. 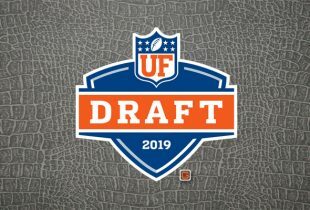 McElwain listed four DBs as rotational players in that role, including senior Brian Poole, junior Vernon Hargreaves III and sophomores Jalen Tabor and Quincy Wilson. Chances are, those four will play gunner sparingly, though McElwain said his goal is to get a lot of players in there in order to keep them from expending too much energy. McElwain has yet to finalize his list of kickoff and punt returners, but expect to see some familiar names on the field at those times, such as Hargreaves and sophomore WR Brandon Powell, among others. With just a week to go until the season begins, Florida’s depth chart should begin to take shape in the coming days. » The Gators have been holding more evening practices than usual in order to get prepared for three straight night games to begin the 2015 season. » Redshirt senior wide receiver Valdez Showers returned to practice on Thursday after missing an extended period of time with an undisclosed injury.